‘The Wind in the Willows’ Thimble Set. The set consists of four superbly sculpted and highly detailed thimbles Toad, Badger, Ratty and Mole, they all fit into a pewter car thimble holder. To Celebrate the 100th Anniversary of the publishing of one of the most loved children's stories, The Thimble Garden has created this unique set of thimbles. ‘The Wind in the Willows’ Hand Painted Thimble Diorama. 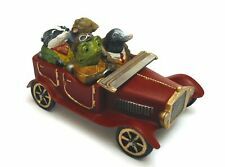 The set consists of four superbly sculpted and highly detailed thimbles Mr Toad, Badger, Ratty and Mole, they all fit into a pewter car thimble holder. Collection can be arranged from our charity warehouse in Sheffield S9. Pewter Thimble Sword in the Stone in two parts with decorative crystals. Condition is Used. Dispatched with eBay delivery – Shutl 2-3 days. The thimble is decorated with a beautifully detailed elephant, while the base of the thimble is decorated as a brick wall. 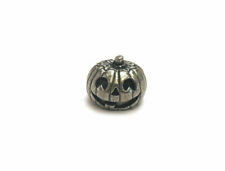 Pewter thimble made in the UK from lead free pewter. 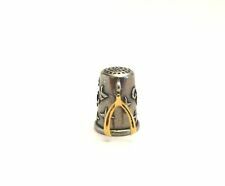 Set of 5 Pewter thimbles. Fagin. Bill Sykes etc . Condition is New. Dispatched with Royal Mail 1st Class. 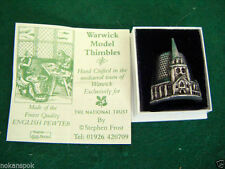 The subject of sale are collector's thimbles. Made by Westair in UK and both are unopened. Tudor (1552) &. 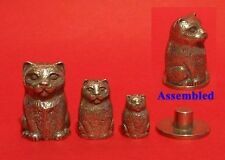 These unique pewter stacking thimbles have been sculpted in the form of Cats/Kitten, there are three thimbles and a pewter stand. 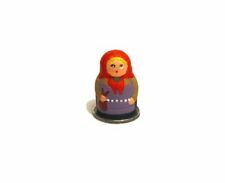 Pewter Cat Russian Doll ( Nesting ) Thimble. x4 RARE Vintage Pewter Thimbles New York, Chicago, Branson, Pony Express - three are still BOXED/sealed in package Condition is Used. Dispatched with Royal Mail 2nd Class. 42 collectable mostly advertising thimbles, and rack in v nice condition. 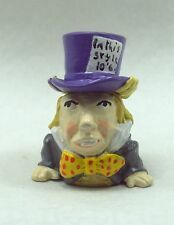 We cast the 'Mad Hatter's Tea Party' diorama from our moulds in pewter then antique & hand polish. The Set consists of two main thimbles 'The Owl' and 'The Pussycat' and also two small thimbles 'The Honey Jar' and the 'Money Bag', they all fit on a boat thimble holder. ‘The Owl And The Pussycat’ Hand Painted Thimble Set. 20mm high with an internal mark 'MW(?). Made in England'. Very good condition. Woodlands rescues and cares for neglected, unwanted and injured animals, including wildlife. We specialise in rehoming cats and guinea pigs and rehabilitating hedgehogs. This set of hand polished pewter thimbles would make a great gift for any thimble collector, or a unique addition to your own thimble collection. The Pewter Thimble Train. The Set consists of two main thimbles 'The Owl' and 'The Pussycat' and also two small thimbles 'The Honey Jar' and the 'Money Bag', they all fit on a boat thimble holder. ‘The Owl And The Pussycat’ Thimble Set. IN 'AS FOUND' CONDITION I HAVE MADE NO ATTEMPT TO CLEAN THE THIMBLE. A ROYAL AIR FORCE ASSOCIATION COLLECTABLE. These thimbles are produced exclusively for The Thimble Garden. A superbly sculpted set of hand cast polished pewter thimbles, depicting the three monkeys from the famous Nikko Toshogu Shrine in Japan.